Learn about different types of bridges through hands-on exploration. 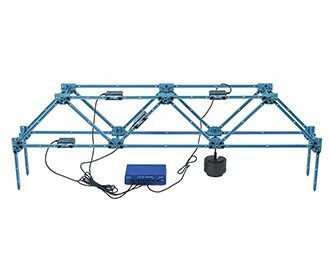 Measure the tension and compression in beams for different bridge designs. Each bridge is loaded by hanging from a weight from the bridge The tension and compression in the I-beams are measured with load cells. The load cells can be moved around to explore the load in every beam in the bridge. First, students build a bridge with rectangular segments. of course, bridges are never made this way but students will never understand why until they try it. Next, students build a Warren bridge with triangular segments. This shows how much stronger triangular segments are than rectangular segments. Students build a second Warren bridge on a different scale to discover how the forces change in this bridge that has twice the number of segments but spans the same distance. Verticals are added to the larger Warren bridge. Students will find that the loads do not change when the verticals are added: So why are verticals used? Additional verticals are added to make a Full Warren bridge. Then the students change the Full Warren to a Pratt bridge. How are the forces different in a Pratt compared to a full Warren?